The English Language Adobe Acrobat PDF owner guides for the Panasonic FZ100 is now available for download at Panasonic.com. 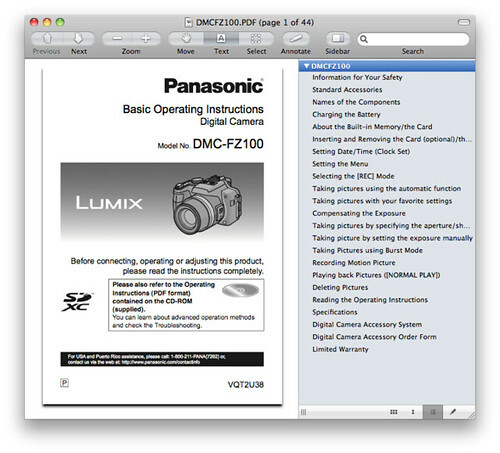 There are two versions of the user manuals, titled “Panasonic DMC-FZ100 Digital Camera Basic Operating Instructions” and “Panasonic DMC-FZ100 Digital Operating Instructions For Advanced Features” respectively. 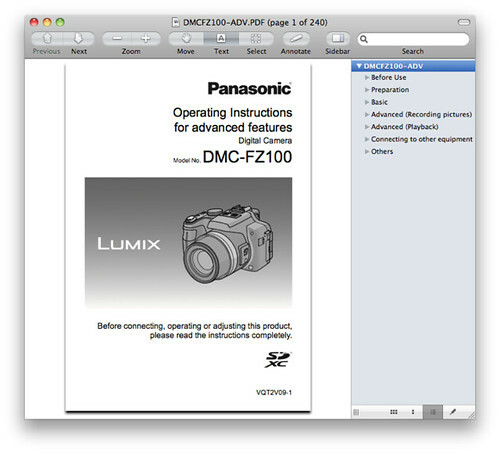 Unlike with Nikon, Panasonic allows you to freely print or copy portions from the DMC-FZ100 owner’s handbooks without building in any password protection into the PDF. The guides discusses the features of the Lumix FZ100, tips and techniques on how to use the camera. In particular, the Basic manual is suitable for quick reference to camera functionality in the field, while the Advanced manual is more appropriate for deep learning and familiarization with the camera. 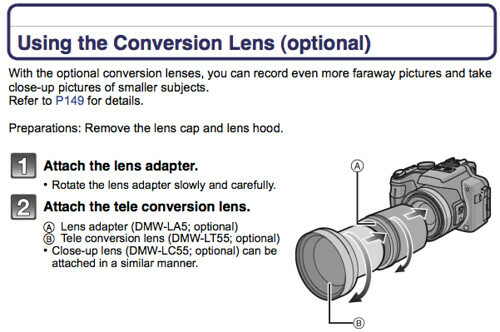 Page 202 & 203: Using conversion lenses — Panasonic DMW-LA5 Adapter, Panasonic DMW-LT55 55mm Tele Conversion Lens and Panasonic DMW-LC55 55mm Close Up Lens. 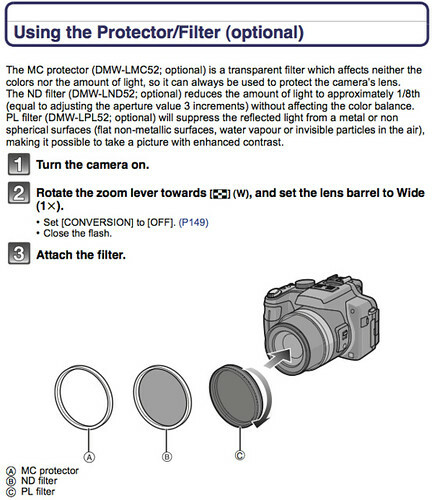 Page 122: Using filters – the Panasonic LMW-LMC52 Multi Coated Clear Protection Filter (or compatible 52mm UV Filters), Panasonic DMW-LND52 Neutral Density Filter (or compatible 52mm ND filters) and Panasonic DMW-LPL52 Polarizing Filter (or compatible 52mm linear polarizer filters). 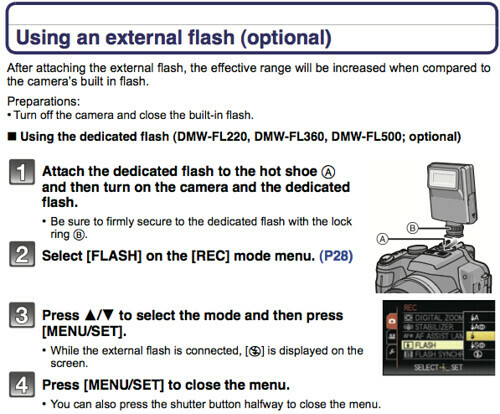 Page 205 & 206: Using Panasonic external flash units with the FZ100 — namely DMW-FL220, DMW-FL360 and DMW-FL500. 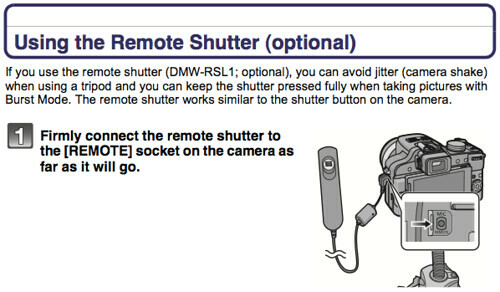 Page 207: Using the Remote Shutter – This page talks about using the Panasonic DMW-RSL1 cable shutter release remote control (see also third-party, compatible makes). 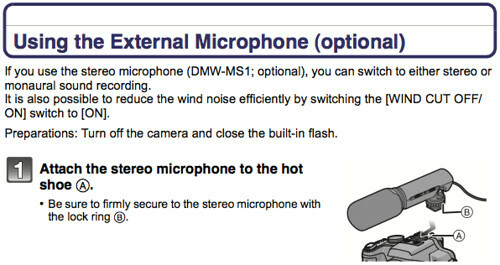 Page 208: Using the External Microphone – Record better audio for your FZ100 movies / footage / video clips with the Panasonic DMW-MS1 external stereo microphone mic.